Ah. I remember the first time I ever bought my own roller skates. I would look at them in the box, terrified of them, yet desperate to get them on my feet and see what I could do. I would wait all day until my mum got home from work and then she would drive me to car park and teach me how to skate. I remember how wobbly I was. How I clung to the railings for dear life. How the wheels on my feet seemed so unnatural and weird, yet so exciting... I would cry with the fear of it all yet I would keep putting them on... No, this is not a fond memory from my childhood. This was just a year ago. It has been a whole year since I started roller derby. A year since I first plucked up the courage to go along with my friends and see what it was like. A year since I first strapped a pair of skates to my feet, refused to move, and went home in tears. A year since I bought my first pair of skates and just kept coming back. I fell, I hurt, I cried, but I never gave up and here I am, a whole year later, doing things on skates I never would have imagined. I am always one of those people who try something, find they're rubbish at it, and stop. I have a fair few musical instruments to prove that point! But, for some reason, roller derby wouldn't let me do that. I literally could not move on skates. I had to be pulled up and down the rink. I came home, burst in to tears, and complained about how scary it was and how terrible I was. Yet, the next day I went out and bought a pair of roller skates. Admittedly, my mind was back and forth, and the moment I bought them, I wanted to take them back. But something tipped me over the edge. Something said "Go on. Why not jump?" And so I did. And I've been falling (in love) ever since. I can't explain what it is. I don't know if anyone who plays roller derby could put in to words why they truly love it. You also probably want to say "Hang on, Honey. What about the times when you've written about a rubbish session?" Well yeah. That happens. I certainly don't go through life loving every single day. But it's the good that makes you forget all the bad. I might have a crap training session. But I go back and nail that skill I've been so desparately trying to get, or I just end up having a laugh with my fellow skaters. I could never imagine giving it up. In a whole year, I have skated about 350 hours, been to over 50 training sessions, over 70 social skates, bought 2 pairs of roller skates, one pair of plates, 16 wheels, 4 toe-stops, 6 pairs of laces, a ridiculous amount of socks, NSOd 27 bouts, proposed to all 4 of my derby wives, watched god knows how many clips or bouts online, mentioned the words "roller derby" about a gazillion times, won an award, bought personalised t-shirts, helmet stickers, hoodies, and toe guards, got a roller derby tattoo, written 51 blog posts, met so many lovely people, amazing people, people who inspire me, people who I've inspired, people who I now call friends. Roller derby has changed my life. I know a lot of people claim that. But it probably is true, and it certainly is with me. I was never a confident person, but roller derby has brought me out of my shell. It has made me louder, friendlier, more talkative. I drive miles for bouts, where I used to hate just driving down the road. I talk to complete strangers like they were long lost friends. Even when something terrifies me, I don't quit, the urge to give it a go just grows. I go to social events, when I used to hate just leaving the house. It has made me believe that I am capable of so much more than I give myself credit for. If you are reading this for the first time and fancy giving it a go. Do not waste any more time. Find your local league and join! If you've just started but are feeling low, do not give up. You will get there. I promise you. Things that look scary now will become so easy that you will have no idea how you couldn't do it. If you've been skating for a while, well then, you know exactly what I'm talking about. Honey, I found your blog a few days ago. 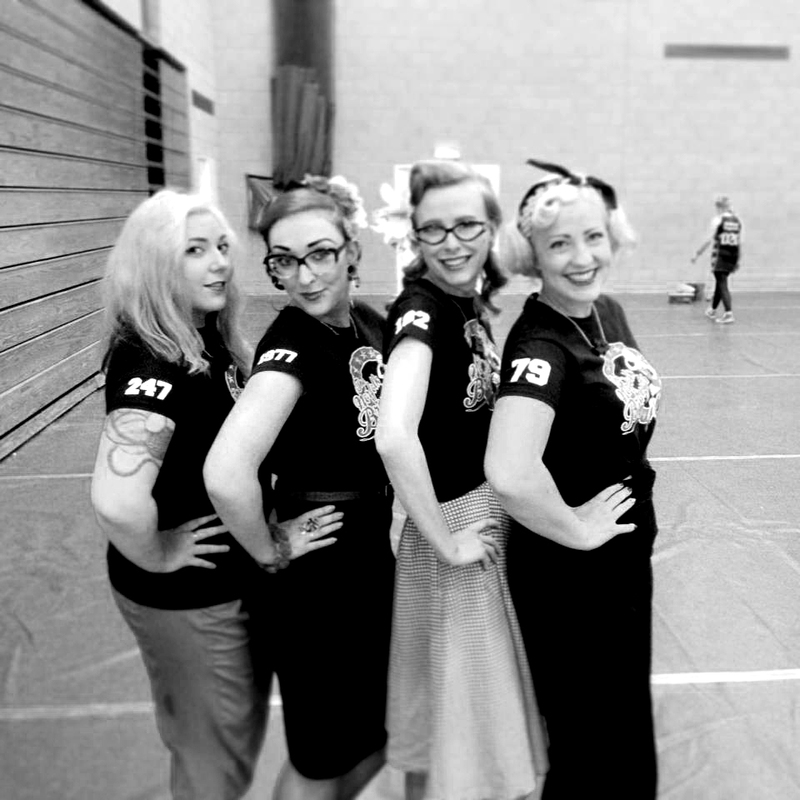 I've been reading Gemma's blog for a few years now, and at her first mention of Roller Derby, my interest was piqued. I didn't think there was a league near me (I'm from Australia) until a couple of weeks ago I saw signs in Byron Bay advertising a public bout. As soon as I saw the signs, I brought it up with a friend "let's give roller derby a try!" She seemed pretty keen too, but it is now a couple of weeks later and I've heard nothing more about it from her. So, Friday night, Whip It came on the TV station I was watching with my boyfriend. I told him how much I wanted to try roller derby and he laughed! I am not very co-ordinated, I'm tall and lanky, I wear glasses and I am a bit of a wuss. He thought there is no way I could do it! 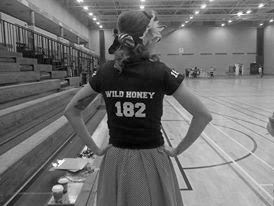 Nevertheless, seeing Whip It reignited my interest in the sport, so I got online, revisited one of Gemma's roller derby posts, found your blog and started reading from the start. You have given me the confidence I needed to give roller derby a real go. To stop thinking about it, and just do it! I've contacted my local team to see when their next fresh meat intake will be, although I'm afraid it could be some time because they just had an intake in January, I've drummed up a few people to come along with me, and I've convinced my boyfriend to take me to the local skating rink tomorrow so I can have a go at skating! Thank you for being such an amazing inspiration to me. I can't wait for my roller derby journey to begin and I look forward to reading your blog in the meantime!